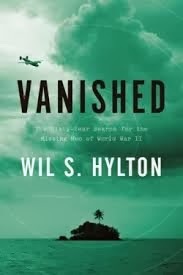 Vanished: The Sixty-Year Search for the Missing Men of World War II by Wil Hylton was a book that I was excited to start and then glad to have read. Vanished covered well a lot of ground, including it being a history lesson on U.S. airmen in the Pacific during WWII as well as a look at one man's quest first to find B-24 bomber crash sites around the island of Palau and then to help the military recover remains of those missing in action. The story from Hylton has as central figure Pat Scannon, a U.S. civilian who became interested in bomber crashes in the South Pacific and then spent years searching for the wreckage of a particular plane. It was cool to to read about how this effort became so much Scannon's "thing" and interwoven by Hylton into the narrative around Scannon was detailed information about the servicemen that went down and their families back home. With remains not found, it became difficult for many to have closure about the deaths in combat and particularly featured in the book was WWII airman Jimmy Doyle and his son Tommy Doyle who was only a baby during the war. One thing I found was the story felt to drag on at times, but looking back after finishing it, I think that it wasn't really that anything wrong with the book. Rather, I found while reading that I was comparing Vanished to another non-fiction book around a WWII plane going down in the Pacific, Unbroken by Laura Hillenbrand. That story of Louie Zamperini and his life probably was more more compelling for a reader as the subject such an amazing one, but Vanished was a really well done work on people that might have been otherwise forgotten. Also, it doesn't seem a stretch at all to say this idea of not forgetting people who sacrificed their lives to be one of Scannon's primary motivations. The research by Hylton into the book felt to be pretty exhaustive while reading it and this showed in the notes and list of sources, which included mention that the cover photo for the book taken by combat photographer Tim Hetherington who died during an attack two years ago in Libya. Both before starting and I was reading, I came across a number of positive mentions of the book by other writers whose work I find to be excellent and the tweet below from Hylton contains a short and seemingly spot-on review by Luke Dittrich.